We have you covered – coming or going. 24/7 for Over Thirty Years. Our Fleet of 26 trucks is ready when you need us. SAFE DELIVERY OF YOUR VEHICLE IS GUARANTEED! Getting stuck on the side of the road is every driver’s nightmare. 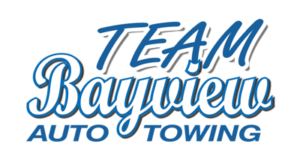 If you find yourself in need of speedy assistance, Bayview Towing is ready to respond at the drop of a hat – or the stall of an engine. Our company is fully insured and able to handle everything from a simple boost to the towing of a motor home. No matter how difficult your request, you can rest easy knowing that you are protected. Striving for excellence is one of our primary goals because our clients are of utmost importance to us. We provide top notch towing services in Surrey, Langley, and Cloverdale. We believe by providing our clients with fast, affordable towing services we can meet their needs.